Rupert Wyatt passed on making a sequel, never mind a complete trilogy of Planet of the Apes movies which then gave writer/director Matt Reeves (Cloverfield, Let Me In) an in to complete the trilogy and go on to now be penning and planning a solo Batman film for WB's DCEU. Would Wyatt have preferred this career path? Who's to say? And who's to say if Wyatt had rounded out the Apes films that he would have been offered the Batman film at all, but it does stand to question if Wyatt regrets his decision to pass on such high profile opportunities. 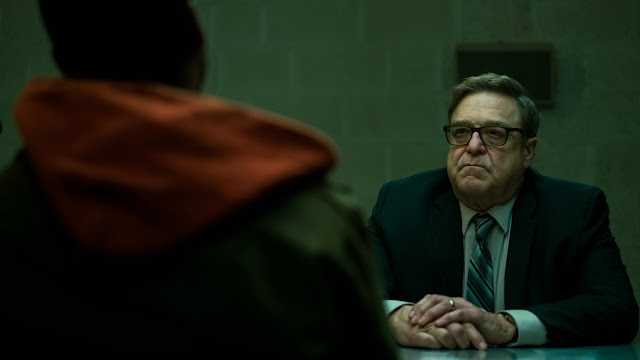 Since deciding not to return to the world of stories about simians though, Wyatt has only made one feature (2014's re-make of The Gambler for Paramount which held a $25 million production budget and only turned over a $39 million worldwide gross) with Captive State being his second outing into feature-length material and a seemingly personal one at that. Wyatt co-wrote the screenplay for Captive State with Erica Beeney (The Battle of Shaker Heights) and serves as a producer, but this low-budget drama/thriller has more in common with Wyatt's 2008 breakout, The Escapist, than it does his 2011 introduction to the mainstream despite posing as a tale that typically functions on the same scale or budget as a Planet of the Apes sequel. This is all said because I like Wyatt as a filmmaker. I think the guy has a knack for striking the right, more intriguing chords in what otherwise might be considered mundane material and yet-with his own script-he fails to bring enough of his own voice to a genre that has been worn thin. Looking like Neill Blomkamp, but feeling more in the vein of Steven Spielberg's War of the Worlds, Captive State is a post-alien invasion movie that sports a fair amount of interesting imagery in its surprisingly effective handheld approach, a tight script whose final ten to fifteen minutes proves this thing had its head screwed on tight the whole time, and a score from Rob Simonsen that stands the all-important test of remaining engaging apart from the images it was meant to be paired with. 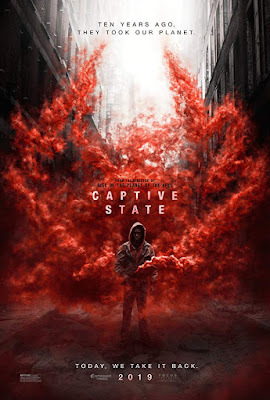 On the other hand though, Captive State is also juggling a handful of disparate parts making it not nearly as interesting as all of these elements would purport it to be. There is a serious lack of investment in anything going on and there is a lot going on; there is simply no forward momentum within the narrative or within any of the characters as much of the races in which these characters are running feel familiar without ever adding much to the conversation. Detective William Mulligan (John Goodman) interviews a potential rebellion leader in a reality where earth is no longer human beings' planet to run. John Goodman, Ashton Sanders, and Jonathan Majors are each given the most to work with here, but Wyatt almost regrettably fills his cast with a great roster of character actors-including Alan Ruck, James Ransone, and Kevin Dunn as well as Madeline Brewer and Machine Gun Kelly in bit parts-but gives them little to nothing to do. The most shameful offense to the under-utilized players here though is that of Vera Farmiga who ultimately comes to play a key role yet only appears in maybe five total minutes of the movie. What is largely Goodman and Sanders' movie means the two make well with that they're given and by virtue of their presence some level of engagement is earned, but while it's clear the film as a whole is a very meticulously plotted and deliberately paced piece none of these elements reach the heights of providing the audience anything to genuinely be engaged with or entertained by. At the very least, with this being a science-fiction tale of sorts, there was some expectation for a strong allegory and while there's definitely some subtext to the going-ons here it is too broad to really hit any kind of nail in a cutting or insightful manner. In the battle between order and chaos, there is a rare balance struck in Wyatt's Captive State that unfortunately leaves room for very little excitement.